Known as the ‘gentle art’, Brazilian Jiu-Jitsu (BJJ) is a martial art that allows a smaller, weaker person to successfully defend themselves against a larger, stronger attacker. Jiu-Jitsu focuses on taking the fight to the ground and applying chokeholds or joint locks to defeat their opponent. Brazilian Jiu-Jitsu modified traditional Jiu-Jitsu and Judo techniques to meet the demands of real, no rules fighting that was prevalent on the streets and beaches of Brazil. How is Jiu-Jitsu different than other Martial Arts? BJJ has the most developed method of fighting on your back, a position weaker people will often find themselves when attacked. There is also a large focus on applying technique through live sparring or “rolling”. In 1914, Japanese Jiu-Jitsu champion Mitsuyo Esai Maeda migrated to Brazil to help establish a Japanese community. He was aided by Gastao Gracie. 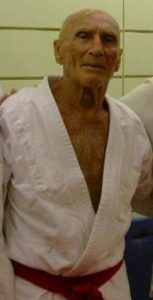 As an expression of his gratitude, Maeda taught Gastao’s son Carlos Japanese Jiu-Jitsu. Carlos taught Maeda’s techniques to his four brothers. In 1925, they opened the first Gracie Jiu-Jitsu academy in Brazil. One of the brothers, Helio, was 135 lbs and in poor health. Because of his small stature, Helio paid special attention to the use of technique. He began to work and adapt the basic concepts of Jiu-Jitsu by introducing leverage to the art. This made it possible for a smaller opponent to defeat a larger one. He began experimenting, modifying, and enhancing the basic techniques. Thus began the development of a more effective ‘gentle art’: Gracie Jiu-Jitsu, otherwise known as Brazilian Jiu-Jitsu.